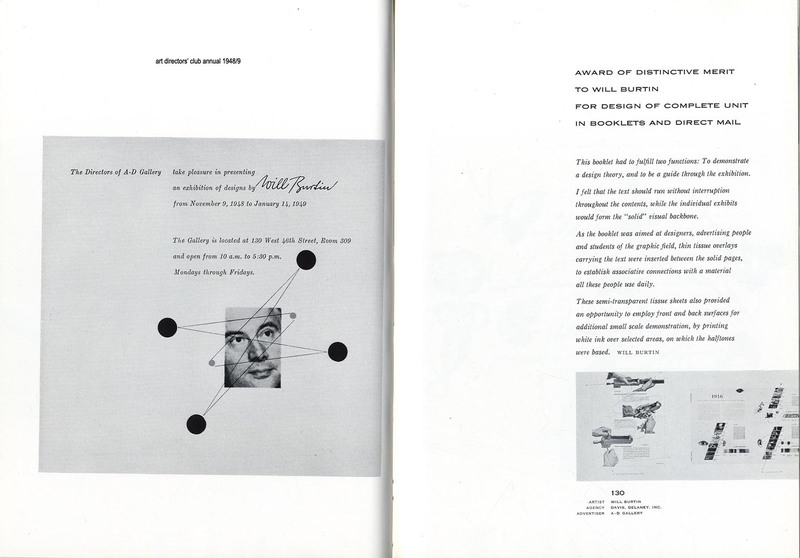 Notes on Will Burtin, Editorial Designer. Each year an editorial designer addresses the course on aspects of the basic language of design. To supplement this live experience, we offer the example of Will Burtin whose work is well known but deserves to be better known. Here is a series of ideas and themes. He wrote in "Design and Communication" in G.Kepes (ed) Education of Vision, Braziller, NY 1965. "Our cultural heritage has been immensely enriched by a vocabulary of communication devices of well defined recognition values, be they shapes, colours, letters, signs, songs, music, or line drawings, paintings, sculptures, even certain aspects of architecture. In addition, technical innovations have been introduced during the last hundred years - mass printing, photography, the film, television, electronics, to name only a few - which have brought an entirely new range of creative possibilities to express thoughts more efficiently and to influence more people than ever before in history." " Each aerial gunner had to learn his gun's mechanism inside out in the shortest possible time. Consequently the message had to be direct and swiftly to the point. A movie was considered for the purpose but tests proved that movies had poor memory value in terms of detail, even in repeated showings. Therefore a loose leaf manual was chosen, retaining as much as possible of cinematic techniques....photographs were silhouetted so as to bring out detail and interpose no square halftone blocks in the visual stream. Titles were pulled out of the textblocks, set bold to facilitate an easy visual grasp of the subject, but set no larger than the body type to avoid disrupting in the sequence of operations..."
In Graphis No 27, 1949; Will Burtin wrote further of "Integration - the new discipline in design". "Man is the total sum of his experience. His scale and focus change continuously as he studies, grows and develops. Therefore, in designing, we must realise that steadily changing conditions confront us, to which we can only adjust ourselves by : constantly developing better and more precise ways of expressing ideas ; investigating anew with each new assignment the entire range of approaches; understanding the mechanics of vision....Understanding of space and time relations is a main requirement in visual organisation. In printed design, images are superimposed on paper surfaces. The spaces inside and between letters, between lines of type, their relationship to illustration, are vital factors which determine the eye's access to basic information. As we read from left to right, a flow develops, which must be utilized to connect the various parts of a message, text and illustration. This movement can be accelerated by keeping type faces and spacing open , or slowed down by condensing them. Thus reading time is as important a measure as the space within which visual communications are organised. In exhibitions, the adding of a third dimension plus physical motion allows full employment of the senstions of timing, scale, structure and volume. In motion pictures, time can be condensed (one year = one minute) or stretched (one second = one hour) and the visual image (space) can develop from realism to illusions of astonishing depths and dexterity. Astrophysics and American Bazaar were parts of portfolios designed for FORTUNE magazine. Each stands for a different subject, resulting in variation of art treatment and composition. An important consideration in art direction is the integration of such units within the larger body of the magazine. This process of integration compares well with a movie, or with three dimensional exhibits, which also have a wide array of sensations, such as fast and slow speed, rise and decline, staccato and smooth flow, noisy and quiet colours, all organised towards a harmonious whole. These experiences are indicative of the direction our visual work is taking, which aims at human control over the at present largely accidental effects of creative impulses." Ezra Stoller , architect, letter to Chris Mullen Oct 1984, "Aside from his flawless sense of design and proportion, Burtin brought to his assignment three new things; a rigid old world training in typography and printing techniques; years of war work on military gunnery manuals in which some fairly complex spatial concepts had to be demonstrated to a lot of semi-literate people; and a whole spatial vision of graphic design." "I recall Mr. Burtin as large in stature, somewhat portly, hair gray and cut short, neatly dressed even when in shirtsleeves , wearing bow ties speaking precisely and in a German accent. " A) 108 : text "A picture gallery of the chief activity of Americans - selling things to one another. "= Photo Hand. H) 115 : Leyendecker ad, Edison Mazda, Chesterfield I) 116 : Pea-nut Queen and Drive-in Waitress, bizarre and lurid effects,"I nearly fainted when I heard them whispering about me..."
M) 120 The Kiss Sells ; window fantasy, foot balm neckties, stockings, and woman in action. 1. Editorial: Making the Free Market Free,Market 1948. 9. Does Distribution cost enough ? 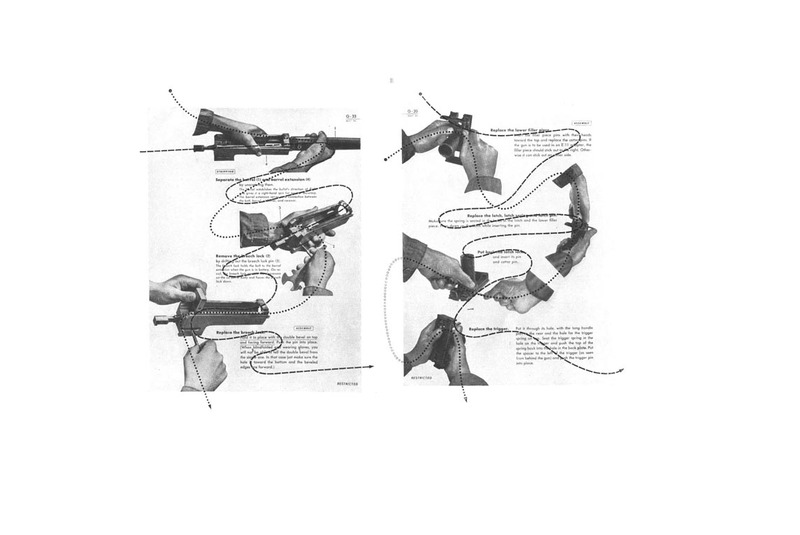 Illustration in Graphis No.22 ; 1948; to demonstrate The Visual Flow, a page from US Army Training Manual, c1944. The dotted line is the eye's first passage over the page. The dashed line is its second passage.